Nearly 4.5 billion kilometers (3 billion miles) from the Sun, Neptune orbits the Sun once in 165 years, and therefore has made not quite a full circle around the Sun since it was discovered. With an equatorial diameter of 49,528 kilometers (30,775 miles), Neptune is the smallest of our solar system's gas giants. Even so, its volume could hold nearly 60 Earths. Neptune is the densest of the four giant planets, about 64 percent heavier than if it were composed entirely of water. The most obvious feature of the planet in Voyager pictures is its blue color, the result of methane in the atmosphere. Methane preferentially absorbs the longer wavelengths of sunlight (those near the red end of the spectrum). What are left to be reflected are colors at the blue end of the spectrum. * Solar ultraviolet radiation destroys methane high in Neptune's atmosphere by converting it to hydrocarbons such as ethane, acetylene and haze particles of more complex polymers. * The haze particles sink to the cold lower stratosphere, where they freeze and become ice particles. * The hydrocarbon ice particles gently fall into the warmer troposphere, where they evaporate back into gases. * The hydrocarbon gases mix deeper into the atmosphere where the temperature and pressure are higher, mix with hydrogen gas and regenerate methane. * Buoyant, convective methane clouds then rise great distances to the base of the stratosphere or higher, returning methane vapor to the stratosphere. Throughout the process there is no net loss of methane in Neptune's atmosphere. Neptune is a dynamic planet, even though it receives only 3 percent as much sunlight as Jupiter does. Several large, dark spots are reminiscent of Jupiter's hurricane-like storms. The largest spot is big enough for Earth to fit neatly inside it. Designated the "Great Dark Spot" by its discoverers, the feature appears to be an anticyclone similar to Jupiter's Great Red Spot. Neptune's Great Dark Spot is comparable in size, relative to the planet, and at the same latitude (the Great Dark Spot is at 22 degrees south latitude) as Jupiter's Great Red Spot. However, Neptune's Great Dark Spot is far more variable in size and shape than its Jupiter counterpart. Bright, wispy "cirrus-type" clouds overlaying the Great Dark Spot at its southern and northeastern boundaries may be analogous to lenticular clouds that form over mountains on Earth. At about 42 degrees south, a bright, irregularly shaped, eastward-moving cloud circles much faster than does the Great Dark Spot, "scooting" around Neptune in about 16 hours. This "scooter" may be a cloud plume rising between cloud decks. Another spot, designated "D2" by Voyager's scientists, is located far to the south of the Great Dark Spot, at 55 degrees south. It is almond-shaped, with a bright central core, and moves eastward around the planet in about 16 hours. Voyager also measured heat radiated by Neptune's atmosphere. The atmosphere above the clouds is hotter near the equator, cooler in the mid-latitudes and warm again at the south pole. Temperatures in the stratosphere were measured to be 750 kelvins (900 degrees F), while at the 100 millibar pressure level, they were measured to be 55 K (-360 degrees F). Heat appears to be caused, at least in part, by convection in theatmosphere that results in compressional heating: Gases rise in the mid-latitudes where they cool, then drift toward the equator and the pole, where they sink and are warmed. Long, bright clouds, reminiscent of cirrus clouds on Earth, can be seen high in Neptune's atmosphere. They appear to form above most of the methane, and consequently are not blue. At northern low latitudes (27 degrees north), Voyager captured images of cloud streaks casting their shadows on cloud decks estimated to be about 50 to 100 kilometers (30 to 60 miles) below. The widths of these cloud streaks range from 50 to 200 kilometers (30 to 125 miles), and the widths of the shadows range from 30 to 50 kilometers (20 to 30 miles). Cloud streaks were also seen in the southern polar regions (71 degrees south), where the cloud heights were about 50 kilometers (30 miles). Most of the winds on Neptune blow in a westward direction, which is retrograde, or opposite to the rotation of the planet. Near the Great Dark Spot, there are retrograde winds blowing up to 1500 miles an hour -- the strongest winds measured on any planet, including windy Saturn. Last edited by nick c on Fri Mar 25, 2011 11:09 am, edited 1 time in total. The character of Neptune's magnetic field is important because it helps scientists understand what goes on deep in the planet's interior. * There must be an energy source that sets the region in motion and then keeps it moving. Neptune's magnetic field is tilted 47 degrees from the planet's rotation axis, and is offset at least 0.55 radii (about 13,500 kilometers or 8,500 miles) from the physical center. The dynamo electric currents produced within the planet, therefore, must be relatively closer to the surface than for Earth, Jupiter or Saturn. The field strength at the surface varies, depending on which hemisphere is being measured, from a maximum of more than 1 gauss in the southern hemisphere to a minimum of less than 0.1 gauss in the northern. (Earth's equatorial magnetic field at the surface is 0.32 gauss.) Because of its unusual orientation and the tilt of the planet's rotation axis, Neptune's magnetic field goes through dramatic changes as the planet rotates in the solar wind. Voyager's first indication of the Neptunian magnetic field was the detection of periodic radio emissions from the planet. The spacecraft crossed the bow shock, the outer edge of the field that stands ahead of the planet like a shield in the solar wind, as a shock wave stands out before a supersonic airplane, at 7:38 a.m. August 24, and shortly thereafter entered the planet's magnetosphere. Voyager 2 remained within the magnetosphere for about 38 hours, or slightly more than two planetary rotations, before passing once again into the solarwind. Because Neptune's magnetic field is so highly tilted, and the timing of the encounter was such that the south magnetic pole was very nearly pointed at the Sun, Voyager 2 flew into the southern cusp of the magnetosphere, providing scientists a unique opportunity to observe this region of a gigantic magnetic field. Magnetospheric scientists compared Neptune's field with that of Uranus, which is tilted 59 degrees from the rotation axis, with a center that is offset by 0.3 Uranus radii. After Voyager 2 passed Uranus in January 1986, some scientists thought they might have seen the planet as its magnetic field was reversing direction. Others found it difficult to believe such a coincidence just happened as Voyager passed through the neighborhood. Scientists have no definite answers yet, but think that the tilt may be characteristic of flows in the interiors of both Uranus and Neptune and unrelated to either the high tilt of Uranus' rotation axis or possible field reversals at either planet. Neptune's magnetic field polarity is the same as those of Jupiter and Saturn, and opposite to that of Earth. Neptune's magnetic field provided another clue to the planet's structure and behavior. Observers on Earth hadn't been able to determine the length of a Neptunian day. Cloud motions are a poor indicator of the rotation of the bulk of the planet, since they are affected by strong winds and vary substantially with latitude. The best telescopic estimate was a rotation period of approximately 18 hours. The best indicator of the internal rotation period of the planet is periodic radio waves generated by the magnetic field. Voyager's planetary radio astronomy instrument measured these periodic radio waves, and determined that the rotation rate of the interior of Neptune is 16 hours, 7 minutes. Voyager detected auroras, similar to the northern and southern lights on Earth, in Neptune's atmosphere. The auroras on Earth occur when energetic particles strike the atmosphere as they spiral down the magnetic field lines. But because of Neptune's complex magnetic field, the auroras are extremely complicated processes that occur over wide regions of the planet, not just near the planet's magnetic poles. The auroral power on Neptune is weak, estimated at about 50 million watts, compared to 100 billion watts on Earth. The Rings And "Ring Arcs"
As Voyager 2 approached Neptune, scientists had been working on theories of how partial rings, or "ring arcs," could exist. Most settled for the concept of shepherding satellites that "herd" ring particles between them, keeping the particles from either escaping to space or falling into the planet's atmosphere. This theory had explained some new phenomena observed in the rings of Jupiter, Saturn and Uranus. When Voyager 2 was close enough, its cameras photographed three bright patches that looked like ring arcs. But closer approach, higher resolution and more computer enhancement of the images showed that the rings do, in fact, go all the way around the planet. * The "Main Ring" (officially known as 1989N1R, following the IAU convention) orbits Neptune about 38,100 kilometers (23,700 miles) above the cloud tops. The main ring contains three separate regions where the material is brighter and denser, and explains most of the sightings or "ring arcs." Several Voyager photographs show what appear to be clumps embedded in the rings. Scientists are not sure what causes the material to clump. * The "Inner Ring" (1989N2R) -- about 28,400 kilometers (17,700 miles) above the cloud tops. * An "Inside Diffuse Ring" (1989N3R) -- a complete ring located about 17,100 kilometers (10,600 miles) from Neptune's cloud tops. Some scientists suspect that this ring may extend all the way down to Neptune's cloud tops. * An area called "the Plateau," a broad, diffuse sheet of fine material just outside the so-called "Inner Ring." The material varies considerably in size from ring to ring. The largest proportion of fine material -- approximately the size of smoke particles, is in the Plateau. All other rings contain a greater proportion of larger material. The Voyager 2 plasma wave instrument detected many familiar plasma waves during the encounter with Neptune, including electron plasma oscillations in the solar wind upstream of the bow shock, electrostatic turbulence at the bow shock, and chorus, hiss, electron cyclotron waves, and upper hybrid resonance waves in the inner magnetosphere. Low-frequency radio emissions, believed to be generated by mode conversion from the upper hybrid resonance emissions, were also observed propagating outward in a disklike beam along the magnetic equatorial plane. 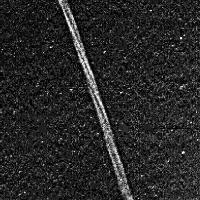 At the two ring plane crossings many small micrometer-sized dust particles were detected striking the spacecraft. The maximum impact rates were about 280 impacts per second at the inbound ring plane crossing, and about 110 impacts per second at the outbound ring plane crossing. Most of the particles are concentrated in a dense disk, about 1000 kilometers thick, centered on the equatorial plane. However, a broader, more tenuous distribution also extends many tens of thousands of kilometers from the equatorial plane, including over the northern polar region. Ring Arc Closeup (QuickTime (MOV) format, 2.1 Mbytes). This animation zooms in on one of Neptune's ring arcs. The "rope-like" structure is caused by smear, since the clumps moved significantly while the the camera shutter was open. See the "Twisted Rope" image below. Taken from a NASA full motion video and converted to QuickTime format. Discovered by Lassell in 1846 only a few weeks after the discovery of Neptune itself. In Greek mythology, Triton is a god of the sea, the son of Poseidon (Neptune); usually portrayed as having the head and trunk of a man and the tail of a fish. Triton has been visited by only one spacecraft, Voyager 2 on Aug 25 1989. Almost everything we know about it comes from this encounter. Triton's orbit is retrograde. It is the only large moon to orbit "backwards", the only other moons with retrograde orbits are Jupiter's moons Ananke, Carme, Pasiphae and Sinope and Saturn's Phoebe all of which are less than 1/10 the diameter of Triton. Triton could not have condensed from the primordial Solar Nebula in this configuration; it must have formed elsewhere (perhaps in the Kuiper Belt?) and later been captured by Neptune (perhaps involving a collision with another now shattered Neptunian moon). A capture scenario could account not only for Triton's orbit but also for the unusual orbit of Nereid and provide the energy needed to melt and differentiate Triton's interior. Because of its retrograde orbit, tidal interactions between Neptune and Triton remove energy from Triton thus lowering its orbit. At some very distant future time it will either break up (perhaps forming a ring) or crash into Neptune. The unusual nature of Triton's orbit, the similarity of bulk properties between Pluto and Triton, and the highly eccentric, Neptune-crossing nature of Pluto's orbit suggest some historical connection between them. Exactly what this might be is purely conjecture at this time however. Triton's axis of rotation is also unusual, tilted 157 degrees with respect to Neptune's axis (which is in turn inclined 30 degrees from the plane of Neptune's orbit). This adds up to an orientation with respect to the Sun somewhat like Uranus's with polar and equatorial regions alternately pointing toward the Sun. This probably results in radical seasonal changes as one pole then the other moves into the sunlight. During the Voyager 2 encounter, Triton's south pole was facing the Sun. Triton's density (2.0) is slightly greater than that of Saturn's icy moons (e.g. Rhea). Triton is probably only about 25% water ice with remainder rocky material. Voyager found that Triton has an atmosphere, albeit a very tenuous one (about 0.01 millibar), composed mostly of nitrogen with a small amount of methane. A thin haze extends up 5-10 km. The temperature at the surface of Triton is only 34.5 K (-235 C, -391 F), as cold as Pluto. This is due in part to its high albedo (.7 - .8) which means that little of the Sun's meager light is absorbed. At this temperature methane, nitrogen and carbon dioxide all freeze solid. There are very few craters visible; the surface is relatively young. Almost the entire southern hemisphere is covered with an "ice cap" of frozen nitrogen and methane . There are extensive ridges and valleys in complex patterns all over Triton's surface. These are probably the result of freezing/thawing cycles. The most interesting (and totally unexpected) features of this unusually interesting world are the ice volcanoes. The eruptive material is probably liquid nitrogen, dust, or methane compounds from beneath the surface. One of Voyager's images shows an actual plume rising 8 km above the surface and extending 140 km "downwind" . Triton, Io and Venus are the only bodies in the solar system besides Earth that are known to be volcanically active at the present time (though Mars clearly was in the past). It's also interesting to note that very different volcanic processes occur in the outer solar system. Earth's and Venus' (and Mars') eruptions are of rocky material and are driven by internal heat. Io's eruptions are probably sulfur or sulfur compounds driven by tidal interactions with Jupiter. Triton's eruptions are of very volatile compounds like nitrogen or methane driven by seasonal heating from the Sun. The Voyager 2 encounter with Neptune and Triton in August 1989 showed a large ionosphere at Triton. Subsequent studies have tried to explain the production of such high levels of ionization but have ignored the possible plasma dynamics originating from the interaction between Neptune's magnetosphere and Triton. This study applies knowledge gained from studying the solar wind-Venus interaction to this case. We find that observations made by Voyager 2 can be explained by downward convection of magnetospheric plasma into Triton's atmosphere, with the flow momentum transferred to the neutral atmosphere near an altitude of 650 km. We show that momentum transfer is accomplished as both the convective velocity and the magnetic field go to zero. The mechanism by which the ionosphere is produced was identified previously as impact ionization from hot electrons originating in Neptune's magnetosphere. These precipitating hot electrons are shown in this study to be unaffected by a magnetic field below roughly 650 km. This is a result not previously anticipated, and one which implies that the plasma interaction between Neptune's magnetosphere and Triton cannot be ignored. Explanation: In August of 1989 NASA's Voyager 2 spacecraft passed by Neptune, the most distant of the solar system's gas giant planets. Its encounter with Neptune climaxed with its closest approach to Neptune's largest moon Triton. From a distance of about 24,000 miles the robot space probe surveyed Triton's surface, whose temperature averages nearly -400 degrees Fahrenheit, and discovered surprising evidence of a complex and active world. For example, the prominent dark streaks in this image seem to come from small volcanoes and may consist of nitrogen frost mixed with organic compounds ejected during geyser-like eruptions. Last edited by StefanR on Tue May 27, 2008 2:25 pm, edited 1 time in total. Explanation: How's the weather on Neptune? Tracking major weather patterns on the Solar System's outermost gas giant can help in the understanding of global weather patterns here on Earth. Each summer for the past five years, Neptune has been imaged and major weather patterns studied. The latest picture, taken on September 15, is shown above in false color. Visible in pink near Neptune's lower right is a new storm dubbed Annabelle that is several times larger than her terrestrial sister Isabel, a concurrent storm system that occurred here on Earth. Although Isabel lasted a few weeks, no one knows how long Annabelle will endure. On the upper right is Neptune's largest moon Triton, an unusual moon that sports volcanoes that spew ice. Feathery white clouds fill the boundary between the dark and light blue regions on the Great Dark Spot. The spiral shape of both the dark boundary and the white cirrus suggests a storm system rotating counterclockwise. Periodic small-scale patterns in the white cloud, possibly waves, are short-lived and do not persist from one Neptunian rotation to the next. Depicted here is the last face-on view of the Great Dark Spot that Voyager 2 made with its narrow-angle camera. The image was shuttered 45 hours before closest approach. The bright cirrus-like clouds of Neptune change rapidly, often forming and dissipating over several hours. In this sequence spanning two rotations of Neptune (~36 hours), Voyager 2 observed cloud evolution in the region around the Great Dark Spot. The surprisingly rapid changes, which occurred over the 18 hours separating each panel, show that in this region Neptune's weather is perhaps as dynamic and variable as that of the Earth's. However, the scale is immense by our standards because the Earth and the Great Dark Spot are similar in size. Lake-like features along the terminator record a time when these regions of Triton's surface were fluid. This 200x200-km (124x124-mi) view was acquired during Voyager 2's closest approach to Triton. This cantaloupe-textured terrain encompasses a region roughly 1000 km (620 mi) across. Complex tectonic and volcanic forces involving icy viscous fluids combined to develop the deformed pattern of this landscape. This view was captured in late August 1989. Neptune observed in the near-infrared (1.65 microns) with and without adaptive optics. Neptune is the outermost of the giant planets in our solar system, but also has the most dynamic and rapidly-changing weather patterns. This near-infrared image is primarily sensitive to such high-altitude clouds, which appear bright against the darker disk. Adaptive optics allows ground-based telescopes to monitor Neptune's evolving weather systems and to use spectroscopy to probe different altitudes in its poorly-understood atmosphere. (Macintosh et al 1999 and Max et al 2000 in preparation). These two images show the changes in the high-altitude cloud structure. The right hand image is the same as the one above taken in May 1999 and the left hand image was taken one month later in June 1999. Voyager 2's first images of Neptune's rings seemed to indicate that it actually had fragments of rings (or ring 'arcs'). When the images were later enhanced and analysed in more detail, Neptune turned out to be orbited by complete rings, but with regions where the material was bunched up in a higher density than other parts of the same ring. The explantion that the scientists came to was that small orbiting satellites had been destroyed by impacts or tidal forces from Neptune in the last decade before the encounter. Otherwise, the debris would have spread itself out along the orbital path of the ring - the bodies did not possess enough mass to pull themselves back together. Voyager's time-lapse images - necessary because of the low light levels at this huge distance from the Sun - recorded particle movement within the ring, causing the arcs to appear denser than they actually are. NEPTUNE: Neptune radiates about 2 times as much heat as it gets from the Sun (it gets about 1/900 as much energy from the Sun as the Earth does). 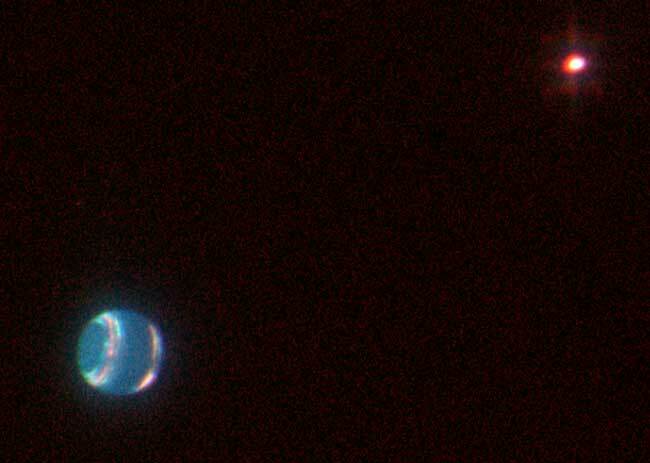 When Voyager 2 flew by in 1989, Neptune had a Great Dark Spot. Although that particular storm disappeared, another appeared in the opposite hemisphere. It had to have been a new storm since Neptunes 2000 km/hr winds at its equator would destroy any migrating storm. CAPTION: Image of the planet Neptune taken using the new adaptive optics system at the 10-meter diameter Keck II Telescope on the Mauna Kea volcano in Hawaii. The image uses infrared light with a wavelength of 2 micro-meters to outline the planet in reflected sunlight. The bright bands are haze layers in Neptune's upper atmosphere. By compensating for the blurring effects of turbulence in the earth's atmosphere, adaptive optics has shown much more detail in the haze bands than has been previously observed from earth-bound telescopes. The dark stripe is a very narrow slit through which light was directed onto a spectrograph in order to characterize the chemical composition of Neptune's atmosphere and the heights of the haze layers.